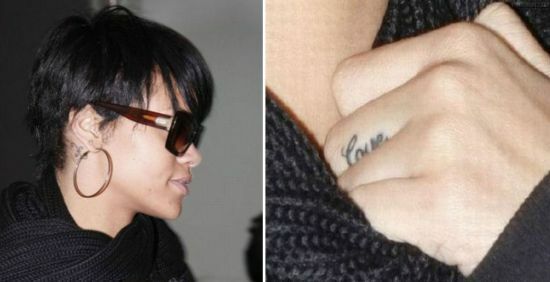 After her rocking performance at the NRJ Awards at Cannes, the umbrella girl, Rihanna, was spotted with her new âLoveâ tattoo, etched very carefully between her fingers. Rihanna looked in no mood of flaunting her new fortune, as she was quite busy with her phone and fans at the Cannes airport. I think Rihanna got this one too, on her recent visit to the tattoo parlour, where she got her starry tattoos etched on the neck. Does her âLoveâ tattoo hint that sheâs in love and is gearing to adorn herself for Valentine? Well, whatever the case may be, this latest tattoo is also very pretty like her other body arts.